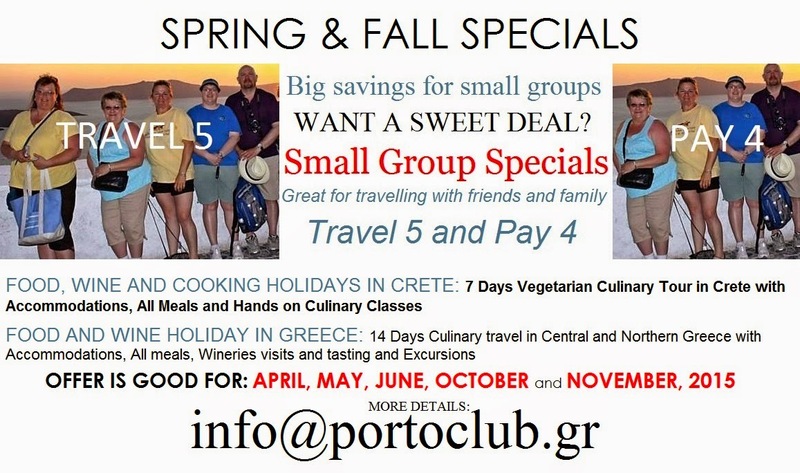 Porto Club Vacations: BIG SAVINGS FOR SMALL GROUPS! Great for travelling with friends and family! This holiday is for people who would like to learn some basic skills in preparing the famous Cretan Mediterranean Vegetarian Cuisine. They will gain hands on experience through class participation. Participants will learn various cooking methods, the big protein question, what foods replace meat, how to balance their diet, eat nutritiously, meal planning tips, and where to shop for ingredients. Porto Club and Paleologos S. A want to thank you for your past patronage, as a thank you to you, we are delighted to offer an Exclusive Guest Offer. 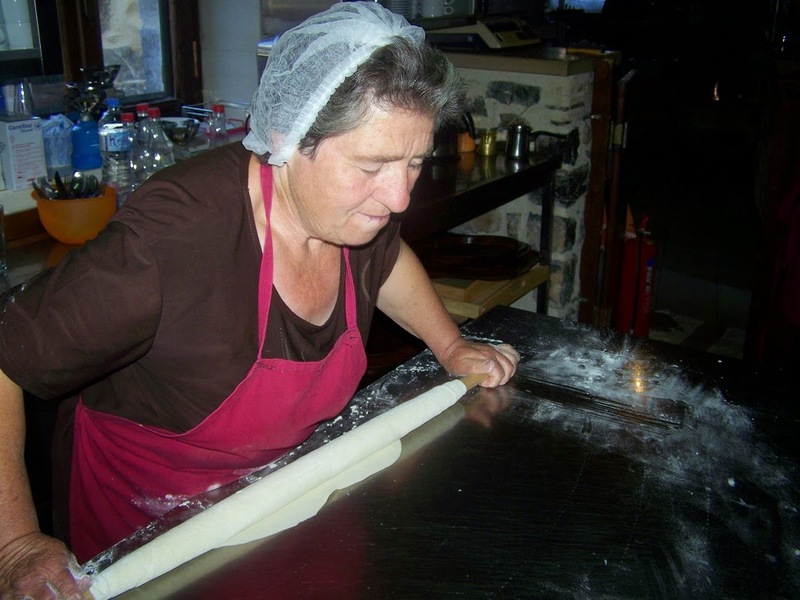 Take advantage of the special discount for the superb cooking holiday in Crete on April, May, June, October and November, 2015. Five different available dates/weeks have been chosen from our side for you. Each of these dates is based on maximum eight (8) persons (individuals, couples or families). This special offer is addressed to small groups of 5 people specially and any other you feel like to invite friend or family. We can really promise of a wonderful week. This vacation will be so much more than tasting fine wines and eating. You'll meet many of the locals, be touched by how warm and welcoming they are and by their passion for their region their wines and their food. It will be a truly local and memorable experience where you'll go home having made many New Greek friends! 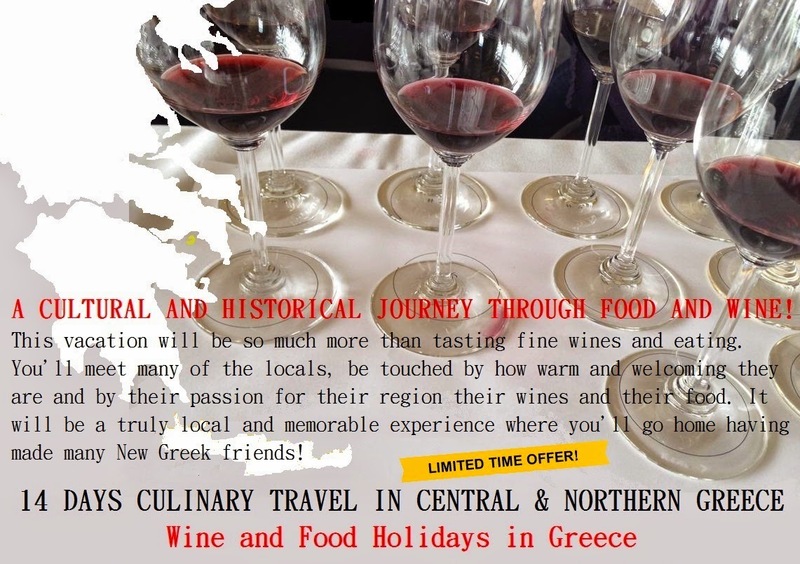 Take advantage of the special discount for the superb wine and food holiday in Central and Northern Greece SPRING AND FALL 2015: April, May, June, October and November, 2015. Five different available dates have been chosen from our side for you. Each of these dates is based on maximum eight (8) persons (individuals, couples or families). We can really promise of a wonderful holiday. Αναρτήθηκε από George Portokalakis στις 11:38 μ.μ. George Portokalakis 18 Ιανουαρίου 2015 - 11:41 μ.μ.